Areton One (Skin Re-Surfacer) Instructions. Hifu 3 in 1 Sample Consent Form. Please read through this manual before using the product. Any other training instruction material including videos and training material should not be interpreted as a substitute to the instruction manual. 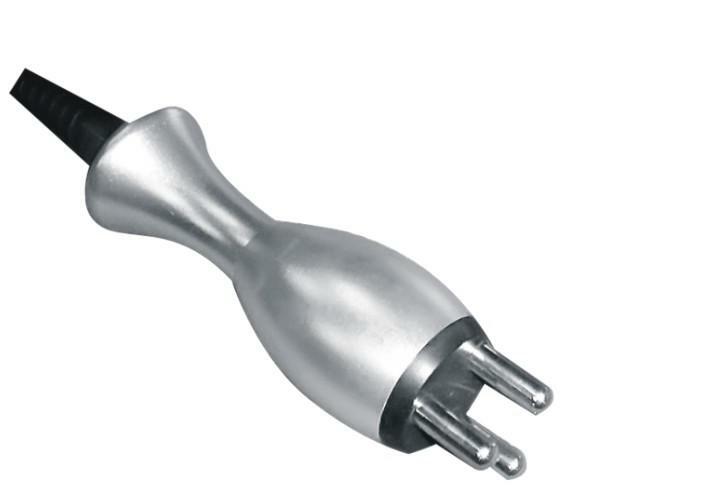 The applications of this product are merely aesthetic, no claims of medical applications are made by the manufacturer. If any changes, our company reserves the right of final Interpretation. Strong ultrasound waves at specific frequencies promote fat tissue absorption (including cellulite), firming skin. Ultrasounds also improve skin elasticity with lasting effects. Radio Frequency tripolar treatment s has the function of tightening and firming the skin. Ultrasound head operating at 40KHz, targets fat cells causing the cells to resonate and consequently break them down. The fat contained therein is then absorbed and removed by the lymphatic system. Please note that any fat removal treatment has to be also coupled with constant sustained physical exercise and a low calorie diet. This technique is an aid to fat loss. A low voltage sine-wave at 10 MHz is applied to the skin. When the RF wave action on the skin, the skin collagen fibre is heated from 45 degrees to 65 degrees depending on the intensity setting of the device and the speed of motion of the handpiece, this causes a collagen regeneration process, restoring skin firmness and elasticity. 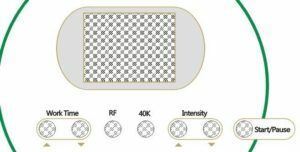 What are the effects of Ultrasound at 40KHz combined with tripolar RF? ♦ Firms the loose skin on the arms, legs, thighs, buttocks, waist, back, abdomen. ♦ Helps lose localised body fat. The treatments has to be combined with appropriate diet and regular exercise. ♦ Improve the appearance of cellulite. ♦ Radio Frequency on the face alone tones and firms up the skin by promoting collagen regrowth. Ultrasonic Continuous Wave at 40 KHz plus three modulated pulsed modes. 10 Power Levels per mode. Simple interface, easy and intuitive to operate. Low cost, fast return on investment. Connect the unit to the power supply though the cord provided. Turn on the unit using the red switch at the back of the unit. Connect the three heads into the red side of the unit . The first two sockets from the front of the unit have three pins each. 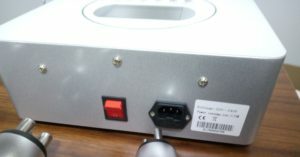 The first socket from the front of the unit is the Body RF Socket. The Second is the RF Face Socket. 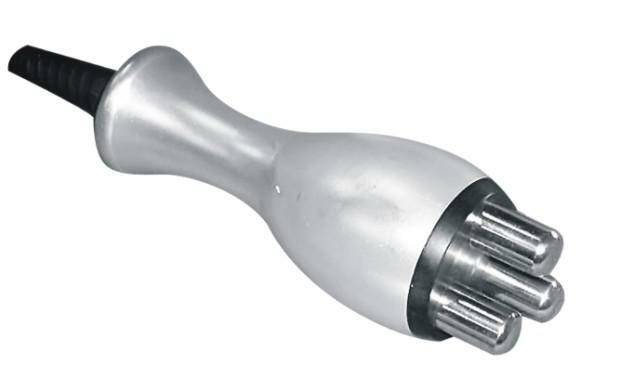 The last one with four pins is the Ultrasound cavitation head. Insert and turn the key on the front of the unit. 1. Apply Sufficient Amount of gel (ultrasound conduction gel). 2. Keep the ultrasonic applicator in full contact with treatment area. 3. Do not keep the ultrasonic and RF applicator at the same place more than 2 seconds and keep moving the applicators constantly. Keeping the applicators on the same place for too long could cause to intense treatments in the specific area. 4. Avoid treating bony areas (i.e. knees and forehead) and and do not use directly on joints. 7. In case of resting during treatment, please “PAUSE” and then “STOP”. 8. After 2 hours continuous device operation please allow about 20 minutes rest. 9. 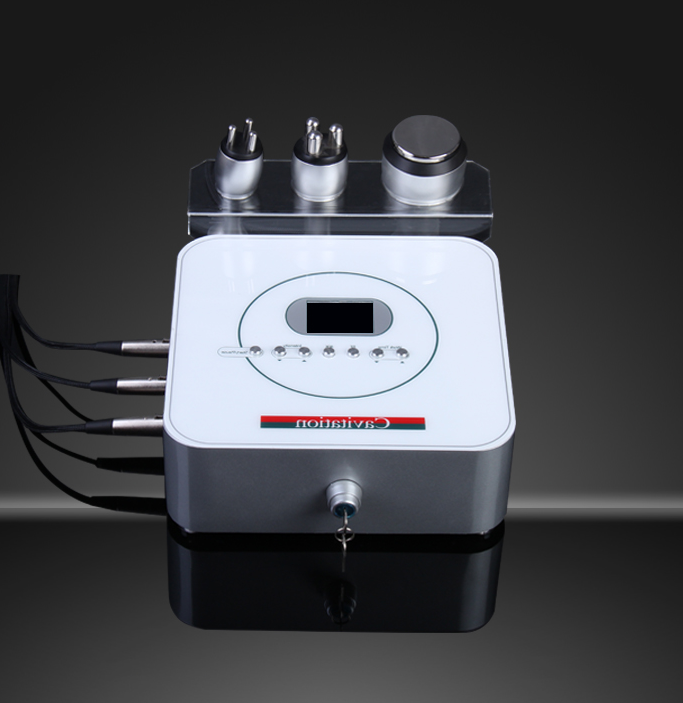 RF Treatment : Press “RF” button into RF treatment interface, default appear body treatment, press twice “RF” button can get into face treatment interface!